Russian aviation has carried out strikes on 1,097 infrastructure sites of 'terrorists'. Russian Aerospace Forces aviation group has carried out strikes on 1,097 infrastructure sites of Syrian terrorists since the start of 2016, head of the Main Operative Department of the Russian Armed Forces General Staff Lt. Gen. Sergei Rudskoi said. "The aviation of the Russian Aerospace Forces continues to carry out strikes on units of international terrorist organizations in the territory of the Syrian Arab Republic. 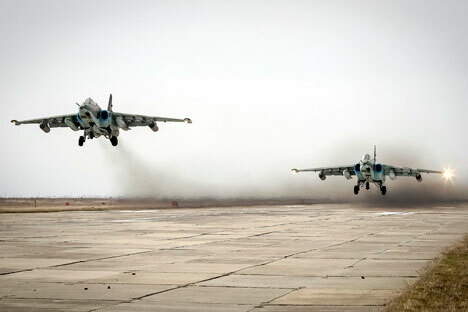 Three hundred eleven combat sorties resulting in destruction of 1,097 objectives in the provinces of Aleppo, Idlib, Latakia, Hama, Homs, Damascus, Deir ez-Zor, Al-Hasakah, Daraa and Al-Raqqah were carried out over ten days in 2016," Rudskoi said. The strikes were carried out on facilities of infrastructure, production and refining of oil, concentrations of the militants' military hardware and personnel in order to reduce military capabilities of terrorist groups and providing a direct support to the Syrian government armed forces and armed units of the patriotic forces fighting against ISIL, the terrorist organization outlawed in Russia, he explained.